Every now and then, Phil and Angie go off on what they call "an adventure!" This is what happened on one of them. 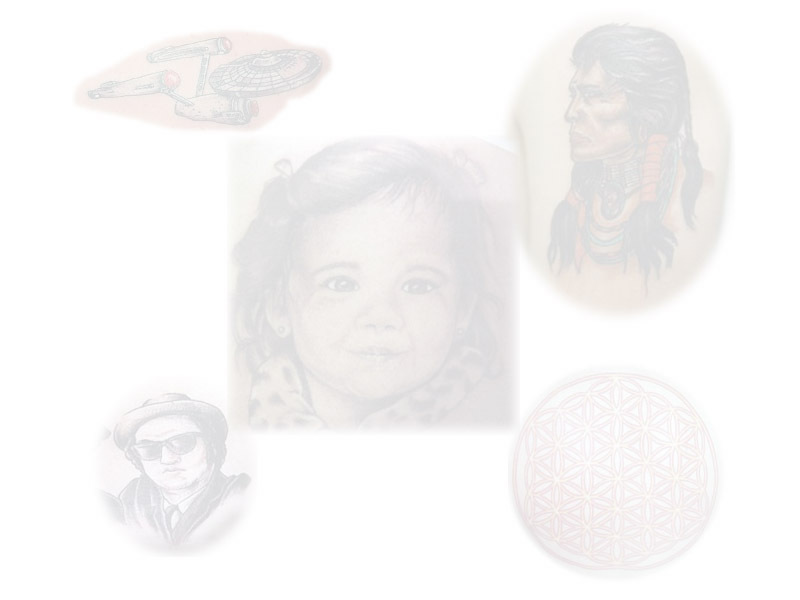 In many cultures, tattooing has been a rite of passage, a way of making a story come to life. In Western society however, it has been looked upon with a certain amount of disdain. This attitude is beginning to change, thanks to wide-spread acceptance of the idea that it is a safe and fun way to express your individuality. This is not to say that it does not have some drawbacks to it. First and foremost, radical steps to the contrary, it is PERMANENT!! It was with this idea in mind that Angie advised me "Be sure you know what you want and where BEFORE you get it, and most of all, be very certain that you want it in the first place!" Angie already has two tattoos. One of a treble clef music signature and the other of a rose, one on each ankle. She has wanted a third tattoo, a butterfly, for sometime. I had kicked the idea around for awhile, but not put too much thought into it. Meanwhile, Angie had been researching where in Chicago to get one. Once she found the place she felt comfortable with, the energy towards getting her third tattoo increased dramatically! It was at that point that I decided to seriously look at getting one myself. I wasn't convinced I really wanted one, largely because I couldn't find a design I liked. I had considered a number of different designs and then while checking out one of my favorite Irish jewelry stores I happened upon a pendant I liked very much. The design spoke to me and told me what needed to be done to make it most effective as a tattoo. From there, it was just a matter of doing a mock-up of it with the modifications and going to have it done! Angie had already done her research into what butterfly she wanted, so everything was ready. The place that Angie had discovered was the Tattoo Factory. They are not only the oldest continuously operating tattoo parlor in Chicago, but they were within walking distance from our place! Providence had spoken...so off we went on a Saturday afternoon, pictures and ideas in hand. Upon arriving at the Tattoo Factory, we were immediately overwhelmed by the vast number of tattoo's that were available to choose from. Oddly enough, it was one of the off the rack butterfly's that Angie actually decided upon. I stuck with my original design. I spoke with Mike Baalke, the tattoo artist who took my design and transformed it into what is now on my upper left arm. "YES! Receiving a tattoo is a painful process. It requires the application of pigment under the first epidermal layer of the skin. The larger the tattoo the longer it will take to do, so small tattoos hurt less than large ones! But remember, people wouldn't get a second tattoo if the first one hurt that bad. Don't be a sissy!" Once the outline is complete, then the fill-in work is done. For me, this entailed applying yellow to represent the gold of the pendant, as well as the customization coloring I wanted done, being the heart of the Claddagh symbol in red, and the crown in green (what else!) While Mike is doing my tattoo, Angie is getting her butterfly done behind a short partition in the rear of the place and a young(er) man in a chair next to me is having a sunburst applied to the small of his back under the watchful eye of his girlfriend. Because he can't see what is being done to him, he is intently eyeing MY tattoo and imagining what is happening to his back! After it's all done, I was given the opportunity to inspect it for final approval and adjustments. Then a bandage is applied, which stays on for about 2 hours. After its removal, an anti-biotic creme is used to keep the tattoo from getting infected. The creme is put on two or three times a day for about 10-14 days. After that, just wear and enjoy! Thanks to everyone at the Tattoo Factory for their work, attention to detail and general good atmosphere! And if that wasn't enough tattoo stuff for you, click HERE to see Angie's NEWEST body art addition! This site created and maintained on a Macintosh! All original works on this site are copyright © 2004 Phillip A Barker, Jr, (except where noted or owned by others), and are registered with the U.S. Copyright Office.